No I’m not in Egypt, or even Paris, and no I’m not with my arms around a lover. But where I am I did stumble on this article on the night lights of Paris. And there are even two separate “schools” when it comes to the science (or is it art?) of lighting the city’s public buildings. There is the Paris school, a holistic approach that bathes a structure in a warm, even glow. The Conciergerie, the one-time medieval prison on the Île de la Cité, and Palais Garnier, the extravagant 19th-century opera house, are lighted this way. Then there is the Lyon school, a pointillist approach that uses small spotlights to highlight the elaborate decorations and details of buildings for more drama. The balconies and niches of the Hôtel de Ville, Paris’s City Hall, and the Pont Alexandre-III, with its candelabras, cupids, sea monsters and other elaborate decorations, are lighted in the Lyon style. Which do you prefer? I love the Paris school. The golden orange light, like liquid stone, seems to begin as spirit, white light, in the pure heart and core of the building, then as it passes through the stone it takes on a golden orange hue with which it penetrates us. The Lyon school is more dramatic, more immediate satisfaction. Que pensez-vous? What do you think? And in the states we tend to throw light onto the buildings, rather than figuring out how to light them from the inside out. We’re getting better though. The arches on the facades of Chicago’s Art Institute are now beautifully lit. Paris school – style. 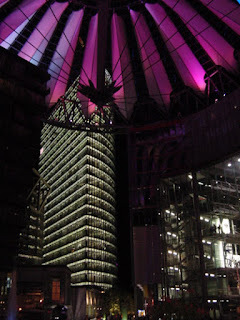 And of course modern, glass buildings get designed with lights, often colorful LEDs, inside the walls, the floors etc. Helmut Jahn, Potsdamer Platz, Berlin. Crystalline. 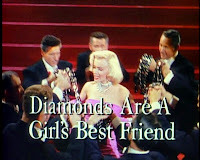 How does Marilyn sing it?….